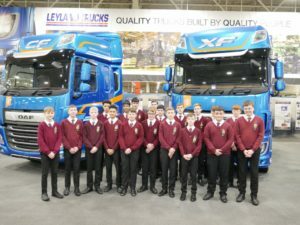 The pupils enjoyed a morning looking around Leyland Trucks Ltd where they were given the opportunity to see the entire production line in operation. They learnt the importance of quality control measures through their systems such as ‘No faults forward’ and the use of sensors to stop wrong parts being used accidentally. They also learnt how employees are engaged in continuous production through their ‘Empowerment’ system. The pupils learnt how 85 trucks were being assembled on site that day and were given an in depth explanation of how ‘Just In Time’ (JIT) manufacturing is carried out effectively. The pupils were also introduced to their apprenticeship scheme and given information about various opportunities within the organisation.